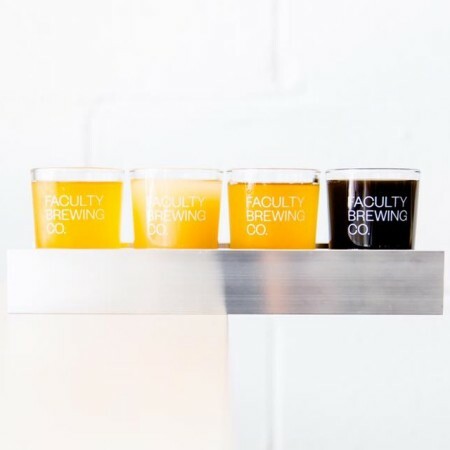 VANCOUVER, BC – A new brewery with a unique college-inspired naming convention for its beers is now open in Vancouver’s Brewery Creek neighbourhood. Faculty Brewing was officially launched yesterday by Mauricio Lozano and Alicia Medina in a 1,300-square-foot space at 1830 Ontario Street. Focusing on quality over quantity, the tasting room and growler bar features six rotating taps, with the beers named using numbers similar to those used for college courses to reflect their complexity, ranging from a 100-series for entry level beers to a 700-series for the most complex and challenging. The initial line-up includes 107 Blonde Ale, 241 Mint Hefeweizen, 305 Saison, 408 Chinook Pale Ale, 419 Centennial Pale Ale, and 710 Oaked Stout, all available by the glass and in growlers to go. Faculty Brewing is open from 2:00 PM to 11:00 PM Monday to Friday, and 11:00 AM to 11:00 PM on weekends. For more details, see the brewery’s website, Facebook page and Twitter feed.